Vijay Hazare, during his playing days. In a country such as India where cricket is considered a religion by itself, representing the country is a remarkable achievement. A fact that lays enough emphasis on a cricketer’s calibre is to be selected amongst the top 15 of the cricket-crazy country. Most of the top-draw cricketing talents are filtered from domestic tournaments held all through the year. The domestic scenario provides an ideal platform for the selectors to keep an eye out for prospective talents who could go on to don the national jerseys. One such tournament that provides ground for emerging talent is the Vijay Hazare tournament, an inter-state championship that follows the One-Day international format. Instituted in 2002/03 as a limited-overs format of the ‘Ranji Trophy’, the trophy was named after the famous ex-Indian player, Vijay Samuel Hazare. 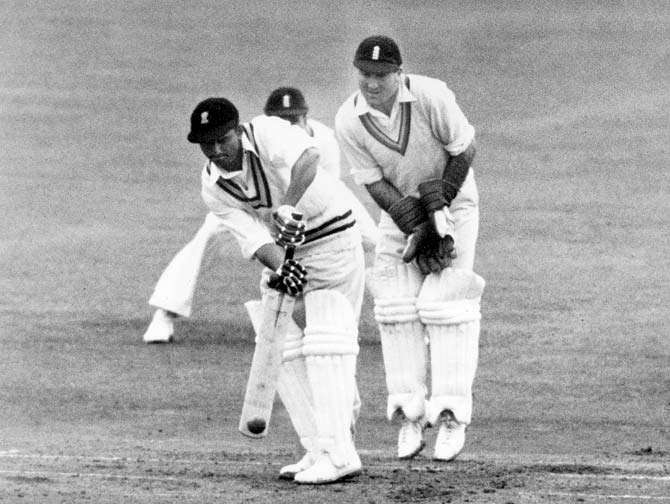 Primarily a right-handed batsman, Vijay Hazare served as the captain of the national team for 14 matches between 1951-1953. Apart from his, he was an established first-class cricketer with a plethora of records under his name. Here, we try to take a sneak peek into his cricketing and personal life on his birth anniversary. Vijay Hazare was born as Vijay Samuel Hazare on 11th March 1915 in Sangli also known as the ‘Turmeric City’ of India, an affluent city in the then Bombay Presidency of British India. He was one of eight children to a school teacher and was educated at the Presbyterian Mission Industrial School in Sangli. All throughout his education and early stages of work, Hazare was never a man who shied away from sports. In fact, he was known to have had a larger interest in cricket and football rather than indulging himself through books. Hazare made his first appearance in cricket as a medium-pacer who could also double up as a wrist spinner while working for his first employer, Maharaj Vikram Singh of Dewas. Looking to improve Hazare’s cricketing skill, the Maharaj summoned Clarrie Grimmett, a legendary Australian spinner to hone his craft. After some keen observations and sessions with Hazare, Grimmett insisted that Hazare was better off concentrating on his batting that his skills with the ball in hand.